The crème de la crème of Corporate Malaysia came together last Monday to pay tribute to the country’s top listed companies and outstanding corporate performers at The Edge Billion Ringgit Club Corporate Awards 2017. 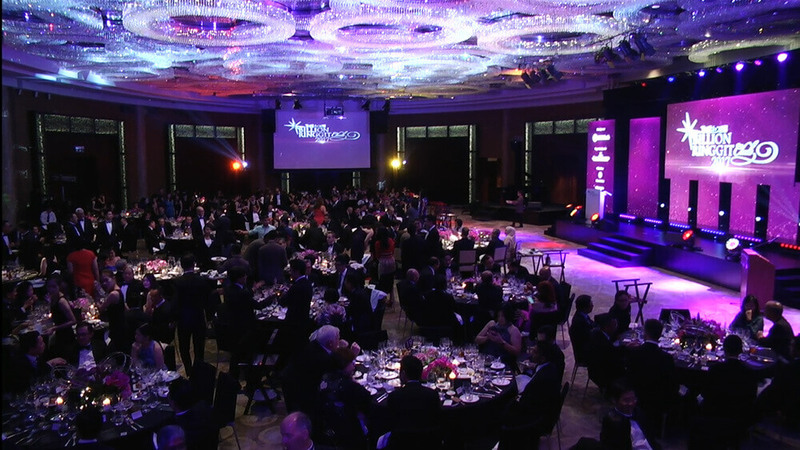 This is the eighth year the awards are being presented. More than 400 guests representing 102 companies donned their tuxedos and evening gowns for the annual black-tie event, catching up with friends and competitors alike. The evening began with a pre-dinner cocktail reception in the foyer of the grand ballroom of the Grand Hyatt Kuala Lumpur hotel. Guests admired the recently launched Mercedes-Benz E300 Coupe Edition 1 — one of only 555 units available globally — that was on display, much to the delight of enthusiasts. Aficionados of horology feasted their eyes on timepieces showcased by Swiss luxury watch maker Jaeger-LeCoultre. The Grand Hyatt ballroom was tastefully decorated with a contemporary yet elegant vibe — a welcoming backdrop as guests mingled before taking their seats for a six-course dinner. Veteran jazz pianist David Gomes entertained during dinner, along with soul songstress Dasha Logan, the daughter of the late Alleycats vocalist Loganathan Arumugam. Diners had a choice of beverages — virgin cocktails, wine, champagne and whisky along with cognac, courtesy of Hennessy. Dapper in his tuxedo and bow tie, The Edge Media Group publisher and group CEO Ho Kay Tat took the stage for his welcome address, in which he presented the key highlights of the overall performance of this year’s The Edge Billion Ringgit Club (BRC) members. The awards ceremony commenced as guests finished their dessert of strawberry mousse with pistachio cake and raspberry sorbet. AirAsia Bhd was crowned The Edge BRC Company of the Year while Westports Holdings Bhd executive chairman Tan Sri G Gnanalingam was named this year’s Value Creator: Malaysia’s Outstanding CEO. Westports CEO Ruben Gnanalingam accepted the prestigious award and Jaeger-LeCoultre’s Master Ultra Thin Perpetual pink-gold timepiece on his father’s behalf. Also present at the dinner was Puan Sri Siew Yong Gnanalingam. AirAsia — represented by its co-founder and executive chairman Datuk Kamarudin Meranun with his signature red AirAsia cap — was one of the 56 corporations that bagged a total of 81 company awards, recognising the achievements and developments of the country’s biggest public-listed companies in terms of the highest profit growth, return on equity and total shareholder returns (capital gains plus yield) over three years. Ho presented the awards with OCBC Bank (M) Bhd CEO Datuk Ong Eng Bin, Mercedes-Benz Malaysia president and CEO Dr Claus Weidner, Qatar Airways country manager for Malaysia and Brunei Datuk Muzammil Mohamad and Jaeger-LeCoultre’s managing director of Southeast Asia and Oceania Maxence Kinget. Two special awards were also given out this year. Malayan Banking Bhd received a special award for being the first listed company in the country to breach the RM100 billion mark in market capitalisation. It was presented two business class return tickets to New York, courtesy of Qatar Airways. The Special Award for Public Service went to Astro Malaysia Holdings Bhd for producing the 2016 movie Ola Bola. OCBC Bank returned as the main sponsor of The Edge BRC for the eighth consecutive year. Commenting on this year’s BRC Corporate Awards, Ong said the better performance of these industry giants in environment, sustainability and governance (ESG) bodes well for Corporate Malaysia. “Our heartiest congratulations to this year’s BRC winners for outdoing themselves, most notably through the upward trend in ESG. As the movers and shakers of the business world, they are the ones who set the tone, pace and the agenda for the future. And I am pleased to acknowledge that the right notes are indeed being sounded in an increasingly consistent manner. We must keep the momentum going so that the generations to come will view this as nothing less than the norm,” he said. With all the awards given out, the night drew to a close, though many stayed on to congratulate the winners and to take photographs to commemorate the occasion.